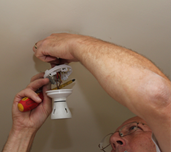 If you need an electrician in South West London fast, then look no further! I/0 Electricians can respond to any emergency electrical problem within 90 minutes in most cases. Our electricians are trained and qualified to carry out electrical repairs, installations, maintenance, re-wires and electrical testing. We operate 24 hours a day, seven days a week, so we can carry out work when it suits you best. Our South West London electricians are all security vetted for your safety.